On the 3rd of October 2005, the European Union finally opened the door on Turkey to begin negotiations which could ultimately lead to the accession of Turkey into EU. This will have profound effects, not only on Turkey but also on the EU and the direction it will then take. These negotiations had been anticipated for a long time and it had been almost 16 years since Turkey formally applied to join the European Community. What this means is that over the course of the next 10-15 years, Turkey will conduct and ultimately aim to complete the necessary negotiations to integrate themselves into the EU. The face of the EU will change dramatically after this and I feel that it is important to examine Turkey and its relationship with the EU a little more closely as it begins the final lap of its journey from association agreement partner to fully fledged member. I feel that it is important that we examine the complex relationship Turkey has with the EU and the possible problems and also advantages of accepting a country as vast as Turkey. Turkey is the only pluralist secular democracy in the Muslim world and has always attached great importance to developing its relations with other European countries. Historically, Turkish culture has had a profound impact over much of Eastern and Southern Europe. Turkey began “westernising” its economic, political and social structures in the 19th century. Following the First World War and the proclamation of the Republic in 1923, it chose Western Europe as the model for its new secular structure under the leadership of Kemal Ataturk1.Turkey views the accession process as a method to modernise their country in the process. Turkey is a founding member of UN, a member of the Council of Europe, NATO, OECD and is also an associate member of the Western European Union. Militarily, Turkey has been aligned closely with Europe for quite some time now and plays a vital role in defence of the European continent. It seemed only appropriate then, that Turkey would seek to more closely link itself to Europe, economically. From this decision, the first EEC-Turkey Association Agreement was created. I am doing this dissertation because i believe it will provide me with a greater insight into the operations of the EU enlargement process in relation to Turkey.I am aiming to determine what the obstacles facing Turkey are and how they are affecting their bid to become a fully fledged member of the EU instead of its current status which is defined under the 1963 Association Agreement. Under these terms, Turkey is considered as an associate member but not a full member of the EU and therefore it does not enjoy its various benefits, be they economic, legal or political. I will begin by looking at the various important documents in relation to Turkey and the EU Enlargement process. 1.1 The Treaty of the European Union. This treaty was signed in Maastricht in the Netherlands and henceforth has become known as the Maastricht Treaty. According to the EU Treaty, the European Parliament and each member state of the EU have to agree to any enlargement. The treaty deals with geographical and general policy issues relevant to Turkey’s accession aspirations. Any country seeking EU memnership must conform to Article ‘O’. founded which such admission entails shall be the subject of an agreement between the Member States and the applicant State. This agreement shall be submitted for ratification by all the contracting States in accordance with their respective constitutional requirements. Any European State which represents the principles set out in Article 6(1) may apply to become a member of the Union. The Union is founded on the principles of liberty, democracy, respect for human rights and fundamental freedoms and the rule of law, principles which are common to Member States. Economic – It must have a functioning market economy, as well as the capacity to cope with competitive pressure and market forces within the EU. Legislative – The applicant country must be able to adopt the corresponding European Law into its own national body of law so that they are brought up to date. This refers to the total body of EU law accumulated up to this point. If Turkey wishes to become an EU member they will have to satisfy each of the 35 Status of Acquis Chapters which are conducted and supervised by the European Council. Criteria of the adoption of the acquis includes the ability to take on the obligations related to membership, including adherence to the aims of a political, economic and monetary union. These chapters cover a very broad spectrum which includes, the Free Movement of Goods, the Free Movement of Services, Telecommunication and information technologies and Financial control. The negotiations are currently underway and it is crucial that Turkey satisfies all 35 Chapters. Turkey became a member of the Council of Europe on August 9th 1949. Considering it signed up just over 4 months after the Council of Europe’s inception, Turkey is still considered a founding member of the organization. Although seperate form the Council of the European Union or even the European Council for that matter, their goals are very much alligned and that is European integration. The Council, in its lifetime has spread the values of human rights, democracy and respect throughout its members and Turkey has been an integral member of the Council. Turkey is answerable to both the European Convention on Human Rights and the Europan Court on Human Rights. Also officially known as ‘ The Agreement Creating An Association Between The Republic of Turkey and the European Economic Community ‘, this agreement between Turkey and the then EEC was, strictly speaking, an instrument for enabling Turkey to ultimately join the European Economic Community. When Turkey first formally applied for membership in 1959, the EEC recommended a preliminary preparatory stage as an associate member and so negotiations on terms took place and were concluded on September 12, 1963 and this became known as the ‘Ankara Agreement’. The agreement came into force on December 1st, 1964 and provided for a number of things, including the free movement of workers, establishment and services. Also included was the aim to completely integrate EEC internal-market policies within Turkey. The aim of the Ankara Agreement was to politically and economically connect Turkey with the EEC much more closely and it envisioned three phases for Turkey’s eventual accession to the EU Common Market through the establishment of a customs union. This was of paramount importance to Turkey as it represented one step closer to the EU. Since the Ankara agreement was established, it has set in motion all agreements beween Turkey and the EU since then. Since the Ankara agreement was established, it has set in motion all agreements beween Turkey and the EU since then. The Additional Protocol was signed in brussels on 23rd November 1970, was approved in the Turkish Grand National Assembly in July 1971 and came into effect in January 1973. The establishment is massively significant and it is due to this agreement that Turkey is now in a position to seek and entitled to expect full EU membership, provided they satisfy all accession requirements. There are cases when the European Court of Justice has been utilised in order to make a decision on the matter of whether or not a Turkish citizen has the right under the Association Agreement to be resident and/or remain in a Member State of the EU. Usually a decision is sought regarding the interpretation of the following pieces of legislation. shall enjoy free access in that Member State to any paid employment of his choice, after four years of legal employment. 2.1.2. Annual holidays and absences for reasons of maternity or an accident at work or short periods of sickness shall be treated as periods of legal employment. Periods of involuntary unemployment duly certified by the relevant authorities and long absences on account of sickness shall not be treated as periods of legal employment, but shall not affect rights acquired as the result of the preceding period of employment. 2.1.3. The procedures for applying paragraphs 1 and 2 shall be those established under national rules. shall enjoy free access to any paid employment of their choice provided they have been legally resident there for at least five years. Ahmet Bozkurt, was a Turkish national living in the Netherlands and working as an international lorry driver for a Dutch firm. In between jobs, Bozkurt resided in the Netherlands. As Dutch legislation did not require Bozkurt to obtain a working or residence permit, he did not seek one. However, after an accident which rendered him unable to work, he sought a permanent residence permit. After initial rejectment form the Raad van State der Nederlanden, Bozkurt appealed under Article 6(1) of Decision 1/80 of the EEC-Turkey Association Council and the case was referred to the European court under Article 177 to determine whether decision 1/80 of the EEC-Turkey Association Council entitled Bozkurt to remain in the Netherlands in his unfit state. The Court ruled that Article 6 of Decision 1/80 did not entitle Bozkurt to remain in the Netherlands as that provision is only applicable to Turkish workers who are currently working in a Member State or are only temporarily incapacitated for work. In other words, the right of to remain in an EU member state after incapacitation is not conferred upon Turkish nationals . Article 6(1) of Decision No 1/80 of the EEC-Turkey Association Council must be interpreted as meaning that a Turkish national who has lawfully pursued a genuine and effective economic activity in a Member State under an unconditional work permit for an uninterrupted period of more than one year for the same employer, in return for which he received the usual remuneration, is a worker duly registered as belonging to the labour force of that Member State and in legal employment there within the meaning of that provision. This Customs Union agreement between Turkey and the EU was finally signed in 1995 and what this achieved was the eradicatication of customs restrictions on goods that travel between the Turkey and the EU. The Customs Union agreement provides for the free travel of goods between the two entities without any customs restrictions. Turkey adopted the Common Customs Tariff of the EC as provided for in Articles 17 and 18 of the Additional Protocol of the Association Agreement which laid down the timetables by which Turkey moved towards the CCT of the Community. However, major areas such as agriculture are not covered and bilateral trade concessions still exist for these products. Although it was agreed in the Association Agreement that free movement of agricultural goods should have come into effect 22 years after the signing of the Additional Protocol in 1973, it was decided, in 1995, to not go ahead with it as both entities are pursuing very different agricultural policies.. Agriculture is currently omitted from this agreement as it would contravene the EU’s Common Agricultural Policy. Therefore the Customs Union agreement focuses mainly on manufactured and industrialized goods and it abolished in reciprocal and progressive fashion, all tariffs and duties on those goods. Officially, it appears as though Turkey has as much free movement of goods as the EU countries but in practice it is much more difficult to operate. To illustrate, Finike, a city on the Mediterranean coast of Turkey and approx 20km north of the Greek island Rhodes, in order to comply with EU standards and regulations, would have to transport their goods up through Turkey and through to Athens so that they could undergo a mandatory laboratory examination in order to determine whether they meet EU criteria and subsequently whether the goods could be imported into the EU. A trip which should be done in 45 mins suddenly takes considerably longer. Article 301 of the Turkish Penal code is probably the most controversial of all the legal reforms undertaken by Recep Erdogans government and it effectively makes it a crime to insult “Turkishness”. The definition of “Turkishness” is broad and incorporates many different areas of Turkish identity, from the Government and its institutions to referring to the mass killing of Armenians as a ‘genocide’. Although these different categories are not legally defined, persons have been prosecuted for alleged insult of them. Article 301 has been in effect since the 1st of June 2005. 1. A person who publicly denigrates Turkishness, the Republic or the Grand National Assembly of Turkey shall be punishable by imprisonment of between six months and three years. This article is highly contentious and could prove to work against Turkey and their EU accession attempts.The European Commission, in its annual progress report released in September 2007, highlighted a series of shortcomings in the areas of freedom of expression and encouraged Turkey to address these issues to accelerate its EU membership bid. In the report the EU stated ‘ …the prosecution and conviction for the expression of non-violent opinions under certain provisions of the Turkish Criminal Code are a cause of serious concern'(2 Turkey progress Report, Commission of the European Communities, SEC (2007) 1436). One of the issues that the EU strongly emphasizes in this report was Article 301 of the Turkish Penal Code (TCK), which has been used to prosecute many writers, intellectuals and journalists for allegedly insulting the Turkish identity and the country’s institutions. This is not the first time that the EU has criticized this article as it has been urging Turkey for a long time to either scrap or radically change 301, which it perceives as violating freedom of speech. Nevertheless, Turkey’s reluctance to deal with this notorious article puts its EU bid at risk as well as diminishing the trust in the country’s judicial system due to interpretations of this article according to non-judicial criteria which is clearly evident. There are many famous Turkish writers who have been prosecuted by the Turkish judiciary on account of their comments being interpreted as unpatriotic. For example, Nobel laureate Orhan Pamuk , who was brought to trial on account of statements he made about the the mass killing of Armenians and Kurds around the time of World War 1. Throughout his trial, he protested his innocence and argued for the freedom of speech without reprimand from the Turkish police or State. The fear aroused from this article is that self-censorship will become the rule of thumb within broadcasting agencies, writers and journalists and Turkey must seek to combat this if they are serious about accession. In 2006, the EU Enlargement officer, Oli Rehn, requested that Turkey ammend their laws in relation to those which restrict freedom of expression . It has developed into somewhat of a problem for the Turkish centre-right government to deal with as they are stuck in a considerable quandry. They are receiving pressure from the European Commission to ammend the law and subsequently give more freedom of expression to Turks. At the same time however, the Turkish government faces a backlash from nationalists in the country as they would see this move as an act of submission of Turkish identity in order to satisfy the EU and the enlargement process. As, for the moment, support for joining the EU begins to dwindle, the AKP need to carefully address this issue. The signs for amendment are positive however. Late in 2007 the Turkish government announced they were looking at amending the article, although very little progress has since been made. This once again, typifies some of the opinions within Europe that alot of what Turkey is doing is very much just a façade so that they can appear to be fulfilling all of the EU’s requirements. Turkey, if it wants to be taken seriously must tackle these pressing issues with more transparency and urgency and must create an environment where they are free to do so without fear of reprimand from the Turkish judiciary based on a justification of a threat to secularism. Article 301 has proven to be self defeating in purpose as this penal code was introduced by the Turkish government as part of wider reform package with the aim of Turkey achieving the same standards as the EU but instead it has attracted a wide range of criticism from all corners of Europe and from within Turkey itself. Concerns for Turkish freedom of expression manifest themselves within the broader media also. Discouraging people from performing military service is also considered a crime under Turkish law. Miklos Haraszti, in his review of the Turkish Penal codes for the OSCE, notes that it ‘becomes punishable for journalists to report or debate on the military service’. 1. Persons who give incentives or make suggestions or spread propaganda which will have the effect of discouraging people from performing military service shall be sentenced to imprisonment for a term of six months to two years. In 1974 Turkey invaded Cyprus to counter what they considered to be a Greek takeover of the island. Since then, the island has been annexed, with the Northern portion known as the the Turkish Republic of Northern Cyprus. Only Turkey recognizes this state. Turkey has stationed 40,000 troops on the island and refuses to recognize the Republic of Cyprus until a solution is found by the UN Resolution 541 (1983), adopted by the UN Security Council, has officially declared the Turkish occupation as unlawful and has called for Turkey to withdraw its forces from Northern Cyprus . Within the resolution, it is stated ‘The Security Council…deplores the declaration of the Turkish Cypriot authorities of the purported secession of part of the Republic of Cyprus…Considers the declaration refereed to above as legally invalid and calls for its withdrawal‘. The UN has attempted to solve this dispute and most recently the ‘Annan Plan for Cyprus’, named after the then UN Secretary General, Kofi Annan, was supported by the UN, Turkey and the European Union. This was the most comprehensive UN effort at a peace plan for Cyprus. What this plan suggested was the creation of United Cyprus Republic. This new country was to be a loose union of two States, the Greek Cypriot State and the Turkish Cypriot State and they would be joined together by a minimal federal government apparatus. Amongst the proposals were plans for a Senate, Chamber of Deputies, Presidential Council and even a Constitution. This plan also proposed a limited right of return between Northern and Southern Cyprus and would also allow a military presence from both Greece and Turkey to be maintained but on a much smaller scale. In the subsequent referenda in both communities, a split decision emerged. The Turkish Cypriots approved the plan with 64.91% vothing in favour of the Plan. The Greek Cypriots voted against the Plan, with 75.83% voting against the proposal . ‘The Community shall provide assistance to facilitate the reunification of Cyprus by encouraging the economic development of the Turkish Cypriot community with particular emphasis on the economic integration of the island, on improving contacts between the two communities and with the EU, and on preparation for the acquis communautaire.’ . The Kurdish people are a large and distinct ethnic minority in Turkey. They represent 15 million people of the total 71 million Turkish nationals. The treatment of Kurds by the Turkish government has been highly controversial and has received international condemnation from both governments and human rights agencies. Turkish forces have, in the past, destroyed Kurdish towns and persecuted Kurdish political parties and leaders as a reaction to acts of violence carried out by the main Kurdish armed separatist movement, the Kurdish Workers Party or as they are more commonly known, the PKK. The Kurdish people, due to their large population, are perceived to be a possible threat to Turkish national unity and as a result the Turkish government has attempted a forced assimilation of the Kurds into Turkish sociey and have introduced a wide range of schemes to suppress Kurdish culture and language. Some of these schemes include and official ban that was imposed on speaking or writing in Kurdish. On all State television and radio, broadcasting in Kurdish was also not permitted as it would have been seen as promoting the Kurdish language and therefore would have been a threat to national unity. The majority of Kurdish people in Turkey live in the extremely poor and underdeveloped region of South and South-Eastern Turkey or else they are scattered elsewhere in other poor, urban areas of Turkey. This is due to the displacement of hundreds of thousands of Kurdish people by the Turkish armed forces who feared a threat from the Kurdish paramilitaries. This, in turn, created a barrier to understanding between the Kurdish community and the Turkish government and administration offices. The PKK took up arms in 1984 as a response to constant suppression of the Kurds by the successive Turkish governments and its ultimate aim was an independent Kurdish State situated in what today is South Eastern Turkey. So the struggle for the area also known as Kurdistan began. Since the conflict began, 37,000 people have been killed and many more have lost their homes. The PKK is listed as a terrorist group by the United States, United Nations and the European Union. According to Human Rights Watch, in a letter to the then Italian Prime Minister Massimo D’Alema, it stated ‘ all economic, political, military, social and cultural organizations, institutions, formations — and those who serve in them — have become targets. The entire country has become a battlefield ‘. There was also criticism for Turkey and the role it had played in this conflict, ‘ Turkish government forces have, in the course of the conflict with the PKK, also committed serious violations of international human rights and humanitarian law, including torture, extrajudicial killings, and indiscriminate fire‘. Amnesty International, along with other human rights organisations, have linked the Turkish armed forces with the disappearance of PKK members. 4. 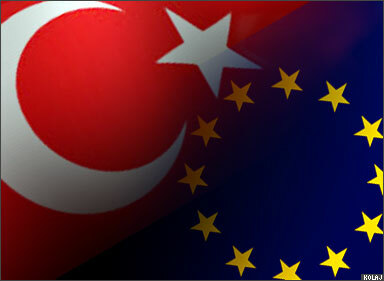 Opposition to Turkeys EU Accession and arguments against Turkish membership. Article 49 of the Maastricht Treaty creates one of the more difficult obstacles for Turkey, insomuch that it states that ‘Any European State…..may apply to become a member of the Union‘. Therefore the question becomes; Is Turkey a European State? Opposition to EU accession has repeatedly revolved around the geographical location of Turkey. Geographically, Turkeys claims of being European does not stand as a very good argument. Turkey is divided into 2 separate pieces of land, Thrace and Anatolia. Anatolia, which comprises 779.452 square km of the country (Thrace contains just 23,764 square km) is situated to the east of the Bosporus Straits and for the purposes of EU accession would not be enough to qualify Turkey . It would appear that it is Thrace, to the east of the Bosporus, which has given weight to Turkeys call for negotiations with the EU, geographically speaking. I believe that if it were not for Thrace, it is very doubtful that Turkey would be in the position that it is in today with regards to accession and membership negotiations. One of the major arguments against Turkey is the fact that it is not geographically situated within the continent of Europe. On 20th December 2007, in an interview with Radio Vatican, German news agency DPA reported that French president Nicolas Sarkozy stated the ‘Turkey is not in Europe but in Asia Minor, and this is a geographical reality‘. Although it is worth noting, however, that there are no set borders in Europe as there are for Africa for example. Sarkozy’s comments must also be seen in the light of the fact that he wishes to set up a Mediterranean Union and this can be seen as an alternative to Turkey acceding into the EU. It appears that political and cultural differences play a major role when it comes to deciding as to who is or is not a member. Cyprus, for example, is situated just north of Egypt and west of Israel and Lebanon, yet it was accepted into the EU and became a full member in 2004. Cyprus is, in fact considered part of Anatolias Continental shelf and according to the online CIA Factbook, Cyrpus’ location is stated as ‘Middle East’. Location of Cyprus, an EU member. If the European Union is to accept Turkey, it would mean the extension of the EU’s borders as far east as Syria, Iran and Iraq. In so doing, this would automatically involve the EU not only in Middle East but also Middle Eastern politics. This was never the aim of the EU, the aim of the EU was closer economic co-operation and EU harmonization. A concern for many European countries is the fact that Turkey is a comparatively poorer country than many of the other European countries and the EU will therefore be inheriting a country badly in need of EU investment and consequently will drain EU resources. There naturally occurs therefore a certain reluctance to negotiate with Turkey regardless of its progression or advancement it has made. The Copenhagen Criteria stipulates that enlargement is not any longer dependent solely on the ability of the accession countries to meet the very strict and thorough requirements of the European Union, but also on the ability of the current members to be able to handle further expansion. Turkey’s accession requirements could be at a time when the EU cannot cope with any new members. Over a period of less than 4 years, beginning on January 1st 2004, the EU has expanded its membership to almost double its members. The consensus it would appear is that Europe, although not able to continue expanding at this rate is that the EU cannot refuse Turkey its right to attempt to join the EU as this could create larger problems down the road for Europe with respect to possible trade agreements. The EU Budget therefore offers Europe the chance to regain some stability and momentum. As they are set out in 7 year terms, it means that Turkey wouldn’t be able to join the EU until the end of 2013 at the very earliest. This is because the current budget is running from 2007-2013 and as everything has been accounted for it would simply not be feasible to accept Turkey before this date, coupled with the fact that the Status of Acquis chapters have not been fully implemented. Major opponents to Turkey’s EU bid are France, Germany and Austria. These countries believe that the EU should offer Turkey a ‘privileged partnership’ instead of full EU membership. Although they can say it outright, it would not be wholly unreasonable to suggest that Germany would oppose Turkish membership as it would mean that Germany would no longer be the most influential country based purely on population( provided Turkey’s proposed population growth trend continues). Germany’s influene and power in the representative European institutions would also be directly affected. Germany also shares a lot of history and strong economic links with Turkey and any negotiations which would lead to Germany publicly having to veto Turkey joining could conceivably lead to the corrosion of relations between the two countries. On top of this, Germany is the location of the largest concentration of Turkish immigrants, which constitute 2.4% of Germany’s 82 million population. There are sound geo-strategic, economic and political arguments to counterbalance doubts about Turkey’s eligibility to join the EU. Or, for that matter, to counterbalance concerns over its European identity. The fact that since 1923, Turkey has modeled itself of on its European counterparts and has, as much as it possibly can, attempted to become part of the European community displays its dedication and commitment to the European way of doing things that simply cannot be denied. Turkey has been striving for EU acceptance and their aim is simple, as former Prime Minister of Turkey, Naim Talu put it: ‘ The objective of the Turkish government is to develop political and economic relations with the EEC, with a view to realizing the final objective of accession to the European Community as a full-fledged member ‘. In a nut-shell, Turkey brings a young workforce, massive economic growth and a huge army to the European Union. On top of all this, the EU sees a westernized Turkey as the best possible obstacle to Islamic fundamentalism, particularly within Europe itself. There are major advantages in accepting Turkey into the EU and this is due to the strategic and economic importance of the country just at the EU’s doorstep. According to the Turkish Statistical Institute, Turkeys GDP rate from 2002-2007 grew at a rate of 7.4 % making Turkey one of the fastest growing economies in the World. The World Bank also forecasts that Turkeys GDP at market prices will continue to grow at a rate of 5.4% in 2008 . According to Bartlomiej Kaminski and Francis Ng, Turkey has benefited greatly from the Customs Union agreement that was signed back in 1995. Not only has it allowed Turkey to receive greater and greater EU investment into the country itself but it has also opened up the industrial market within the EU for Turkey to do business. A result of this Customs Union agreement is that Turkey is no longer as heavily reliant on agricultural produce and exports as it had previously been . Accepting Turkey into the EU would strengthen the EU’s economy with the addition of an OECD founder and G20 member to the bloc. Istanbul, the financial capital of Turkey is also the strategic location which controls the Turkish Straits which, in turn, link the Black and Aegean Seas. In this way turkey could be an engine for growth for both itself and the EU. Turkeys vast oil reserves also make the prospect of accepting Turkey that little bit more inviting. Economic growth within turkey has been significantly higher than in any of the other European Union countries in recent years also. Another benefit of accepting Turkey would be the emergence of a young, motivated workforce willing to travel to obtain employment. Although this is seen as a concern for many Europeans, it cannot be denied that the average age of the EU as a whole is increasing and a fresh injection of young Turkish immigrant workers would benefit both the European and domestic economies. If dealt with properly, it will be possible to reduce unemployment in the EU and any of the particular Member States. The idea that the EU would be swamped with Turkey doesn’t appear to be accurate and a rough estimate of 2-3 million Turks arriving into European Member States seems to be a much closer estimation . This is roughly on par with the type of immigration witnessed when the Eastern European countries were accepted into the EU on the January 1st 2004. In an effort to align itself more closely with the EU, Turkey has undergone a massive overhaul of its Constitution with a total of 34 Articles being amended. This was done to ensure that its political and legal institutions meet with the approval of the EU. Two of the articles which prohibit the dissemination of literature ‘in languages forbidden by law’, have been amended to give more rights to whom they had most directly affected, the Kurdish population. On November 27 2001, the Turkish Grand National Assembly amended the 1926 Turkish Civil Code and it was adopted into law on the 1st of January 2002. This new Civil Code has been instrumental in giving women more rights and freedom of choice and right to property. This new Civil Code was the starting point of a whole range of other amendments and reforms and it introduced improvements with regards to the freedom of association and the right to assembly, as well as gender equality and child protection. Article 186 of the Civil Code now provides for more equality in the marriage and states that the husband is no longer automatically the head of the family. Also, Article 188 states that men and women are given equal status and they can both represent the family in legal matters. Article 416 states that with this Civil Code amendment, not only men but also women are obliged to assume the responsibility of guardianship when appointed as a guardian. Since the Civil Code was amended there have been many reform packages that were introduced to ensure the implementation of the Civil Code but also to completely update Turkeys legislative system. Over the last few years, the Turkish government has passed some major reform packages including the ban on the death sentence, which was brought into force when Turkey signed protocol number 13 of the European Convention of Human Rights. Article 2 (2) of the the Charter of Fundamental Rights of the European Union states, ‘ No one shall be condemned to the death penalty or executed ‘. As such, it was vitally important for Turkey to sign this piece of legislation to respect human life at all times and not just at ‘times of peace’ as had previously been their position. In addition to that, a zero tolerance policy on torture in prisons has been implemented and they have also curtailed the influence of the military in everyday life . All of these reforms have been conducted with the aim of joining the EU. The obvious argument here is that Turkeys democratic institutions would be bolstered even further by joining the EU. Broadcasting and education in minority languages such as Kurdish were legally authorized in 2003 and this is seen as a significant step forward in recognizing the Kurdish population of Turkey and integrating them into Turkish society as opposed to their previous method of failure to recognize their existence. Modern Turkey was established as a secular democracy in a country with a predominantly Muslim population. The significance of this should not be over looked considering Turkeys history and also its geographical location. A major diplomatic and political advantage of allowing Turkey to join the EU would be that a westernized Turkey is seen as a barrier to Islamic fundamentalism. The Turkish membership would be of immense symbolic significance as an attempt to close the gap between the Christian and the Muslim world and the message that it would give to Muslim world about the EU would be one of integration, tolerance and acceptance. It would show that the EU and a major Muslim country joining can work and that they are compatible. Finally, it is worth mentioning that an argument leveled against Turkey quite often is that 99.8% of Turkey’s population are Muslim and a as a result they are too culturally different from a Judeo-Christian based Europe. It is worth remembering however that the EU always argues that it is not a religion based organisation and so on that basis alone any reference to religion should be rendered obsolete; but also Turkey is a secular democratic Republic which defends this fact strongly. Lastly, concerns over Muslim populations living in the EU need only look at present statistics to find that there are 15.9 million Muslims residing throughout the EU . The fact that, since 1923, Turkey has modeled itself on its European counterparts and has, as much as it is possible, attempted to become part o the European community displays it’s dedication and commitment to the ‘European way’ of doing things which simply cannot be denied. Although turkey faces some stiff opposition from certain quarters in the EU, it is undeniable that at this stage they not only have everything to play for but they are also most certainly in control of their own destiny. Turkey has progressed to the point of Accession negotiations and they must not become complacent as they strive for their ultimate foal of full EU membership. I have highlighted some ares of difficulty for Turkey and these must be addressed. Even in 2008, Turkey has not progressed very far with regards to the Statue of Acquis chapters and they have only themselves to blame for that. it is a slow process which involves amending and changing legislation and policy at a rate not necessarily best suited to a nation as vast and different as Turkey. Political pressure and restraints means almost certainly that no longer everyone is happy with the EU from within the country. Resentment of the EU due to the sometimes agonizingly slow accession process has manifested itself within Turkey and EU approval ratings are down. Disillusionment at the whole process is fast becoming a common sentiment within Turkey and further afield. The argument, of course, could be made that this is a concentrated effort by European politicians wary of allowing to Turkey to join. Statements by French President, Nicolas Sarkozy, like: Turkey, which is not European, has no place within the EU are damaging and destructive to EU-Turkey relations. The Copenhagen European Council of 12-13 December 2002 already ruled that ‘if the European Council…decides that Turkey fulfills the Copenhagen political criteria, the EU will open negotiations without delay.’ So, taking this into consideration, it highlights the recklessness of President Sarkozy’s comments and displays possible ulterior motives for issuing the statement. I can only see the result of fostering resentment and undermining Turkey’s EU accession bid by making comments like this. Regardless of Sarkozy’s own personal opinion, the fact of the matter is that Turkey has fulfilled the Copenhagen political criteria and negotiations have commenced, though very slowly. Even at this stage,of Turkey’s bid, I believe that they still have the hardest battle of all to face in the shape of satisfying all 35 chapters of the Acquis. Should they manage to succeed however, I feel that they cannot be delayed entry any longer as they will have been waiting for over half a century to join the EU. That is far and away the longest any prospective country has been made wait. Turkey has made substantial progress in its political and legislative reform process but it must continue to broaden and consolidate its existing legislation and the implementation of it if it desires to one day become a member of the EU. I feel that Turkey has come so far and the EU has dangled the membership-carrot in front of them for so long now that it would be unthinkable that Turkey could be refused entry upon completion of the negotiations. If they succeed, it will be an extraordinary achievement for a country that was once known as the ‘sick man of Europe’.